And then we went to San Chez for breakfast. Forgot to take restaurant photos again. This one is from internet. When visiting a restaurant where I have never been to before, I usually ask the waiter or waitress to recommend their signature dishes. And we ordered Cuban Pork Omelet and Breakfast Empanadas according our waitress’s recommendation. One pot of French press coffee. It tastes kind of sour and bitter, not good at all. The kitchen is semi open. We had a good view of what was going on the kitchen from our table. Contradictory to what we usually see on TV or movie, the kitchen staff didn’t seem busy at all. Everyone was moving kind of slow. When I am cooking in my kitchen, I move a lot faster than these guys. Remember Flash from the movie Zootopia? What I saw in the kitchen this morning reminded me of that DMV scene in the movie. Well, not a good sign anyway. After waiting for a while, our food finally came. Whatever in this plate was hard and chewy. A couple bites later, I totally ost my appetite to continue. So I switched mu plates with his. Bad decision. The omelet on the plate was greasy, fatty, salty and interestingly tasteless all at the same time. The worst omelet I, no, we have ever had. Although the food is poorly cooked and unappetizing, the service was pretty great. It is a myth how this restaurant scores so many good reviews on yelp. This restaurant would never ever make a dime from me. Grand Rapids Art Museum is another our favorite spots in town. After two hours in the museum and one hour walk in downtown area, we still had no appetite for lunch. So we skipped lunch and continue to walk around in the downtown. Wow, that breakfast really sucked for a long time. In the afternoon, we want to Hopcat. Grand Rapids is also called beer city. Hopcat is famous for its beers too. I was told that if you can’t find beer you like in Hopcat, you won’t find it anywhere else. I ordered a glass of Whitsun ale, with lighter color on the left. He ordered Full Circle, with darker color on the right. Both are really good. They are light, fruity, with a hint of citrus. I like both of them very much. 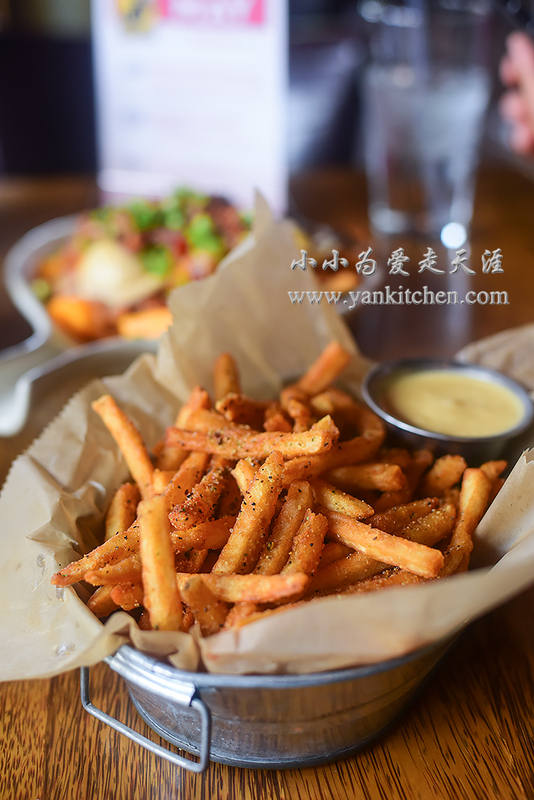 The crack fries are one the ten best fries in America according to Foodnetwork magazine. I am a huge fan of Foodnetwork, so we had to try the fries. The fries are beer battered, deep fried and sprinkled with herbs. It is good, and it is even better with the sauce. I ordered Vladimir Poutine, which is crack fries with raviolis, sour cream sauce, bacons and green onions. It is good when it was served hot. When the plate cooled down, everything becomes tough and greasy. We continued our walk to La Grande Vitesse statue park. Guess what? The annual American Home Brewers Association Big Brew was going on! Homebrewers and craft beer lovers were here to celebrate their enthusiasm for beers. We got there a little bit late, but there were plenty beers left to taste. 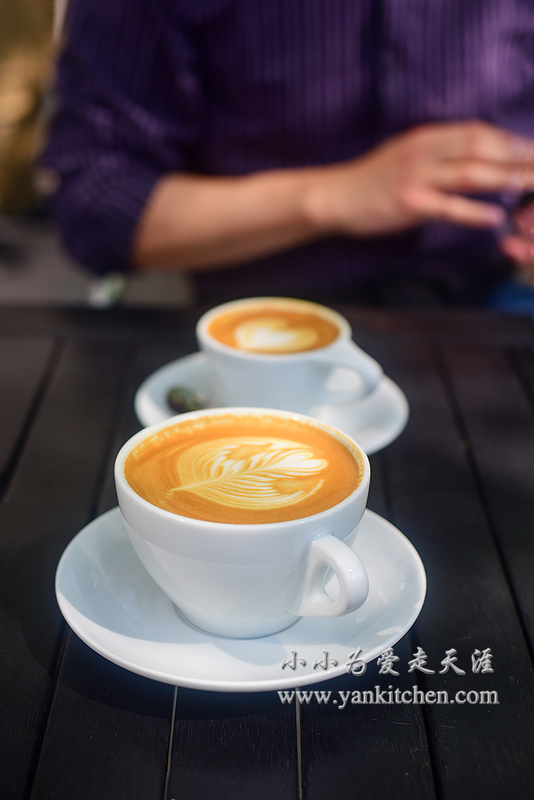 There was a strong intense aroma from espresso and its crema. Frothered milk was silky and creamy. Just one sip, you will know what I am talking about! We sat on a table outside the coffee store, surrounded by those beautiful spring flowers and afternoon sunshine. With a great cup of coffee at hand and the person I love across the table, I feel so happy! The trip ended with two cups of frozen yogurt. Blackberries made really great topping for frozen treats.